Revitalise is a cutting edge all-in-one protein formula to provide speedy gains in muscle size, strength and power. Revitalise has been formulated to combine all the essential supplements needed to help you to achieve your goals in one great tasting protein drink. Revitalise contains a high level of protein with the perfect ratio of carbohydrates to aid recovery and the uptake of nutrients including Creatine Monohydrate. 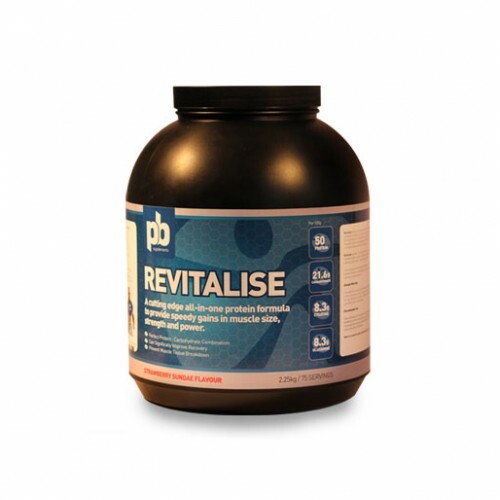 Revitalise contains L-Glutamine which can increase recovery and improve immune support. HMB is also added to improve protein synthesis and prevent muscle tissue breakdown. This is a great protein shake which helps recovery from training, prevents muscle tissue breakdown, aids protein synthesis and improves immune support. Revitalise could dramatically improve recovery times after training and performances. Therefore, it is fundamental for those looking to be able to perform at their Personal Best at all times. Revitalise is also perfect for those looking to improve in muscles size, strength and definition. It is a great tasting all round protein shake with a vast amount of positive benefits form its use. Whey protein and creatine seem to have positive effects on muscle size, strength and athletic performance (Sundell et al., 2011). This product is manufactured on equipment which processes products containing nuts. Therefore we cannot guarantee it is nut free. Although no gluten is added to this product we cannot guarantee that it is gluten free. If you are looking for the best results take 2 servings a day. One with breakfast and the second between meals or after training. Take one scoop (60g) and mix with 350-400ml of milk or water. For best texture mix with a PB Shaker. Other Ingredients: Delactosed and instantised: Pure Whey Protein Concentrate Bioperine, Pure Whey Protein Isolate, Hydrolysed Whey Protein. L-Glutamine, Creatine Monohydrate, HMB, Potassium Bicarbonate, Sodium Bicarbonate, Bioperine, Chromium Chloride, Beta- Ecdysterone, MCTs and EFAs, Natural and Natural Identical Flavouring, Natural Colourings. Stabilisers (Citric acid, Malic acid), Sweetener: Sucralose. Note: Flavouring choice may influence the final declared analysis.